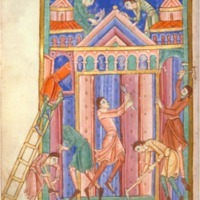 This is a depiction of Thieves Breaking into the Burial Church of St. Edmund from the Life, Passion, and Miracles of St. Edmund. The shoes on the feet of the thieves are simple below-the-ankle shoes with simple decorations, such as the vamp stripe on the shoe of the thief on the far right of the depiction. 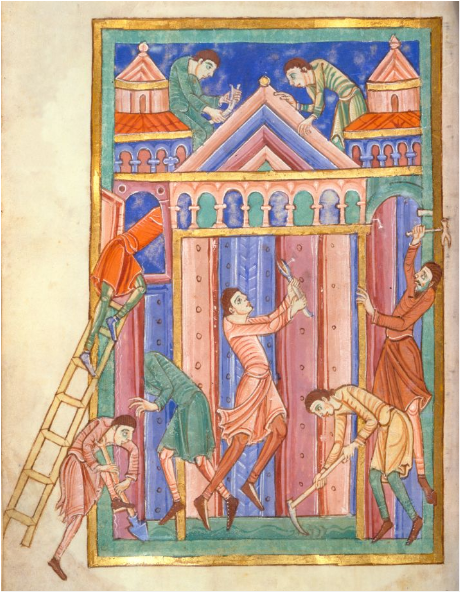 the Alexis Master, founder of the St. Albans school, and an assistant, “The Shoes of Thieves (from The Morgan Library and Museum, MS M.736, f. 18v),” Medieval London, accessed April 22, 2019, http://medievallondon.ace.fordham.edu/items/show/86.